When you first start learning Spanish you need to learn the most common verbs to help you form questions and basic needs and wants. 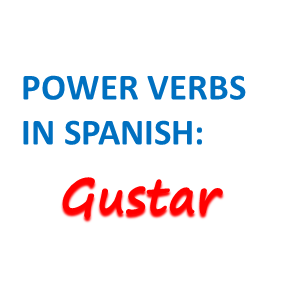 One of the most important verbs to know is “gustar” (to like) so that you can express what you like, what you don’t like and ask other people what they like. This verb works a bit differently to most verbs as you also need the pronoun in front to say who likes the thing. In Spanish they structure the sentence in the opposite way to us. ‘Back to front’ if you like. Dancing – it pleases – me. Me tells you it is “I” who likes it. If the thing that is liked is plural the “gusta” becomes “gustan” (they please). Me gustan los plátanos. = I like bananas. Bananas – they please – me. Note: Always use the definite article (el, la, los, las) when you talk about liking something. * When you include a person’s name to say what “he/she” likes, you also need to add “A” before the person’s name. e.g. “A Pedro le gusta cantar” = Pedro likes singing. No me gusta el queso. = I don’t like cheese. How would you say the following? 6. Do you (2+) like cycling? 7. They don’t like running. 8. I don’t like seafood. 9. Do you like prawns? 10. We don’t like eating late. 3. A Juan le gustan los calamares. 4. A María le gusta cocinar. 6. ¿Os gusta montar en bicicleta? 8. No me gustan los mariscos. 9. ¿Te gustan las gambas? 10. No nos gusta comer tarde.